There’s a store on the main street of Sebastopol, CA that sells great cooking and baking tools. Whenever I drive by, I think about how much I like the name of this store: Cultivate Home. 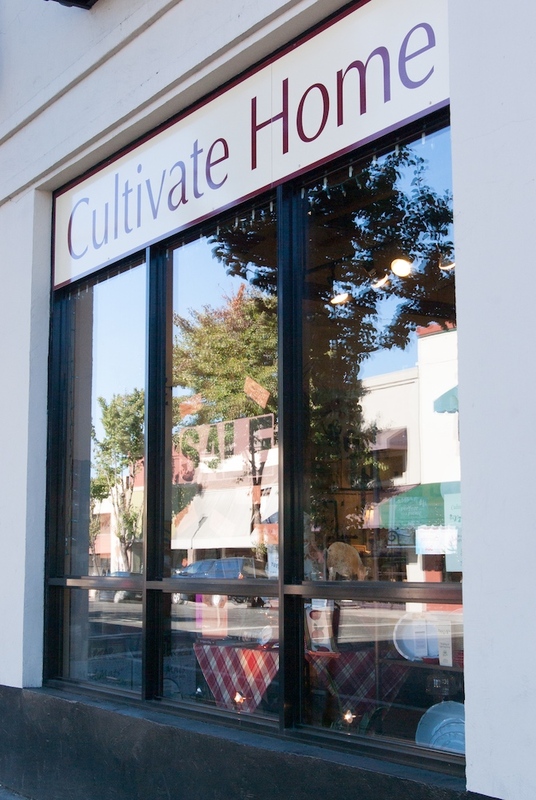 Cultivate is a verb I associate with the garden – preparing the soil, planting seeds, watering and fertilizing, weeding and thinning, and finally harvesting and sharing. It suggests ongoing care and attention. It suggests wanting the plants to grow strong and flourish. It’s a verb that takes time. Cultivating home suggests home is a living thing that flourishes with ongoing care & attention. It suggests an active relationship with home, be it the physical structure or the relationships both inside the house and with the larger community. You don’t just move in, arrange the furniture, hang art on the walls and instantly have a home. It takes time and energy – and not just in terms of vacuuming, dusting, and fixing leaky faucets. I am someone who has always valued home. As a child, I hemstitched yellow napkins and green striped placemats for a Girl Scout badge. I kept these in a Florida Oranges carton under my bed. I called this my hope chest. I wasn’t so much hoping for marriage as I was looking forward to having my own home. Home can mean many things – a house and address; family and pets; a community; a landscape; the place where you were born or grew up; the place you live now; some combination of these. Home is where you feel a deep sense of belonging and connection. It gives you an essential groundedness that helps you be your best self. It’s a place to venture out from and to return to and recharge. When you do invest time and energy in your home, it gives back to you. I know what it’s like to feel at home and to not feel at home. I’ve moved many times in my life – at least fourteen cities and towns in three countries. In each of these places, I’ve worked to create home. I know it doesn’t happen instantly. In fact, I’ve heard it said that it takes three years to feel at home in a new place. In my early twenties, after a visit with family, I decided that home is where I live. So when I move to a new place, I accept that this is where I live now and I do my best to make it a home. I start with a cup of tea in a favorite mug and a walk with the dogs. This is how I begin most days and in a move, these familiar routines help create a sense of home. The cup of tea builds a connection between the old and new homes. Walking the dogs, I start to explore my new surroundings. My invitation to you: One of the ways I cultivate home is my morning cup of tea. Do you have any routines that help you cultivate a sense of home? 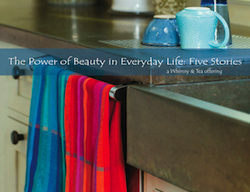 As always, Marilyn, I get such pleasure reading about what inspires the patterns you choose. I love your Highway 101 towels! You are most welcome, Judy. I look forward to hearing about your sources of creative inspiration. In my experience, there are so very many. I love the thought-provoking questions in your newsletters! They always inspire me to slow down my fast-paced, busy life and give thought to the basics of comfort and beauty. I cultivate home by opening up my home to others. It used to be that I would only invite over family for regular “Cozy Dinners” and holidays. It spread to having certain friends over for regular family dinners or an occasional party. Last year we had a great mid-January bonfire (in the snow with an “ice bar” built by my Scandinavian-rooted husband!). We plan to continue the mid-winter bonfire, the fall harvest festival, the Cozy Dinners, the 4th of July barbeque…. Now that my children are older we often host playdates, soccer games, band practice…. A full house feels like home to me. I love when it’s noisy and crowded and fun! I wish you could be here to join us! !